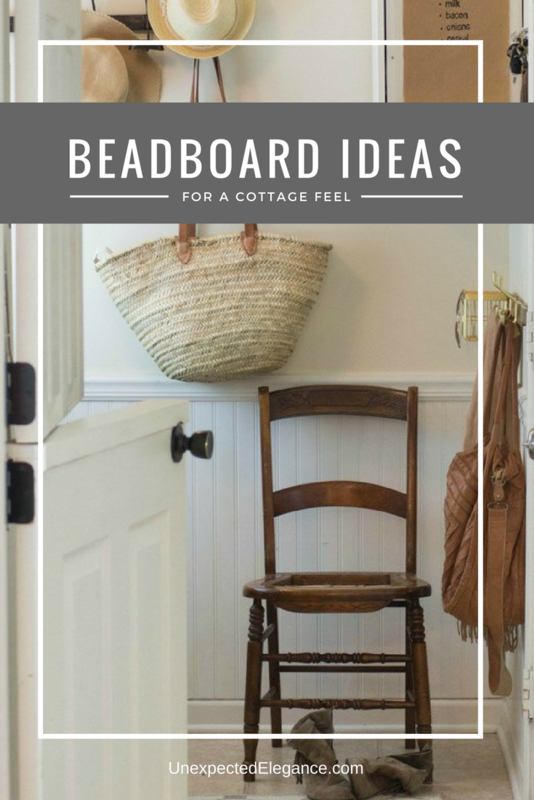 Get some great beadboard ideas for your home, to give it a cottage feel. With these 8 different ways to use it, you are sure to make your home unique! So what is a beadboard ceiling?? If you have an ugly popcorn ceiling, beadboard can be an easy update. All you need to do is nail it in place and paint it. You can also purchase outdoor beadboard so that you can add a good look to the ceilings of your porches. A super easy way to update your backsplash is to cut beadboard to fit and use liquid nail to install. You’ll need to measure carefully and remember to measure for the areas you’ll need to cut out for outlets and light switches. You can add a nice trim to the bottom and top to complete the look. This backsplash from ELLA CLAIRE turned out beautiful! If you have an island of cabinets in your kitchen or a have cabinets that are used as a bar between your kitchen and living room, you can add beadboard to improve the look of the back of the cabinets. This gives your island or bar a finished look. Check out this surprise on Sand & Sisal! Of course, you can’t forget about beadboard wall ideas. 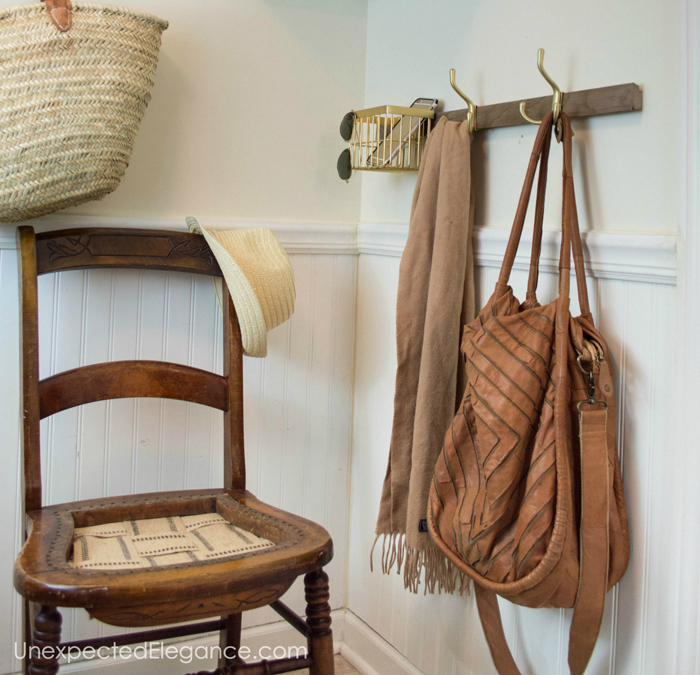 You can add beadboard halfway up your walls and then add a chair rail for a timeless look. This look is especially great in bathrooms. Try painting the beadboard white and painting the walls a dark color for an elegant look. Here’s my laundry room beadboard. If you love the country look, you can also use beadboard on your stair treads. You do not want to do this outside as it can be very slippery when wet. See how Christy over at 11 Magnolia Lane updated her stairs. If you have a set-in tub, you can update the look of the cabinetry around the tub by adding beadboard. You want to make sure to use a plastic or vinyl beadboard that can withstand getting wet or treat wood beadboard with a waterproof stain. Check out this bathtub upgrade from HGTV! Want to update the look of your bookshelves? Cut beadboard to fit on the back of each shelf. This adds an elegant look to an otherwise boring bookshelf. You can improve the look even more by adding trim to the shelving unit. Here’s a great example from Decor Pad. Last, but not least, you can use it to update doors. If you have a hollow door, you can use liquid glue to attach the beadboard to the door. Add the beadboard in four areas to create panels and then add trim to complete the look. You can find an awesome transformation from Pretty Handy Girl, here. TIP: If you want to make your projects even easier, you can use wallpaper like THIS!! Beadboard can be used to update so many different rooms in your home. Best of all, it’s a super affordable upgrade option!